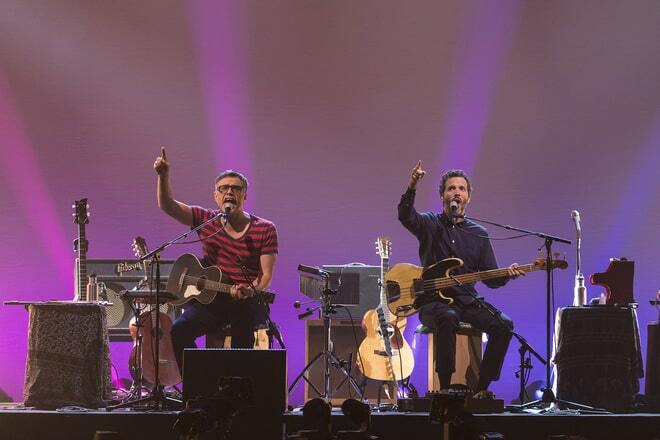 Flight of the Conchords: Live in London Review: The most beautiful band (in the room) – AiPT! ‘Flight of the Conchords’ may have never reached the mainstream popularity of some of the HBO’s more famous shows, but it gained a strong following. HBO has long been known for its strong line of original programming. In recent years there has been Game of Thrones and Little Big Lies to add to an illustrious past that includes The Wire, The Sopranos, and Curb Your Enthusiasm. Flight of the Conchords never reached the mainstream popularity of some of the channel’s more famous shows, but it still managed to gain a strong following. Known for its dry sense of humor. Conchords followed the exploits of the titular New Zealand band’s two members, Jermaine and Bret. The show lasted two seasons and left fans with a catalog of memorable songs. Nearly ten years after the show’s finale, Jermaine and Bret are back together for Flight of the Conchords: Live in London. The first thing long time fans will notice is the high production values of the show. Sure, Flight of the Conchords are a fictional band, but one of the show’s premise was the band’s eternal quest for an actual paying gig. Jermaine and Bret were so innocent and oblivious that seeing them succeed would be akin to watching your friends make it. Seeing the Conchords play in front of a sold out audience is extremely satisfying. The lighting used during the set is nothing particularly special, two giant screens are in the background and there are the camera shots expected from a concert. However, in the history of the band, this is a milestone moment. Jermaine and Bret add to the immersion by never breaking character. Jermaine Clement and Bret McKenzie are far from struggling musicians. On stage though, the two talking lovingly of their homeland of New Zealand and brag about all the adventures they have had on the road. The banter between songs is great as the duo use the same humor that made their HBO show popular to begin with. The two unironically brag about their decadent rock star lives. The main part of the debaucherous anecdote being a muffin matters little; the band is just thrilled to tell everyone about their supposed stardom. Therein lies the true charm of the special. Times have changed since Jermaine and Bret decided to end their show almost a decade ago and the world is a much more complicated place. Even the most low brow comedies cannot seem to escape the need to shoehorn a message into their narrative. Conchords: Live in London is all about turning off the serious side of your brain for about an hour and a half. This is not a show that wants you to ignore the problems of today (an exchange about gender equality is included) but instead tells you it is okay to put them aside for a moment. The special is a nice mix of new material and the classics that fans love. The show opens with a song about a boy and his dad. It appears as if it will be about family bonds and the touching relationship between a father and his song. True to Conchords form, the song hits its first punchline before heading into a series of well crafted one liners. It is a hilarious start to the show that also tells the uninitiated all they need to know about New Zealand’s fourth largest band. What starts as a tragic song about a father telling his young son why his mother is no longer there takes an unexpected turn when the son explains to his father he knows exactly what is going on. Instead of dad sugarcoating the bad news, the son bluntly tells his father what a screw up he is. If a person wants to, they can dig into the song and find hidden meanings of maturity, acceptance, and self worth. But that’s not what the Concords are doing here. In a song later in the set, Bret sings about being a seagull that is flying out to sea while Jermaine explains all the symbolism to the audience. Bret sings that his song is just a song and there are no hidden meanings. It is a funny moment that further lets its audience know its okay to just have fun. There are some small issues with the special. There are some weird cuts early. It is almost as if there was too much footage to work with and someone was trying to squeeze it all in. There is also a guitar solo by Bret that sounds odd. The rest of the special goes without any problems, however. The question with reunion specials is will anyone besides fans actually enjoy them? Flight of the Conchords: Live in London is a fun comedy special that everyone can enjoy. The band concentrate on what they do best and proceed to put on great music while making the audience laugh. Conchords: Live in London will remind long time fans what made the band so special in the first place and have newer fans looking up the band's classics.